ST. GEORGE — The 5th annual “Winter 4×4 Jamboree” brought off-road enthusiast from around the world to join in on the largest winter 4×4 event in the country, raising $48,000 to donate to local organizations, according to a press release from event organizers. The event is hosted each year by the nonprofit Desert Roads and Trails Society, or Desert RATS, in order to raise funds to donate to public land use organizations. 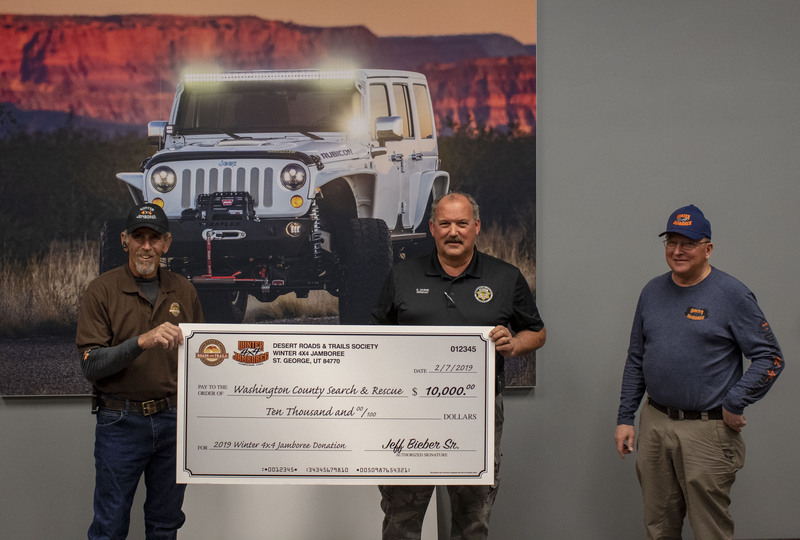 Of the $48,000 that was raised, the group donated $25,000 to Utah Public Lands Alliance, $12,000 to Utah 4-Wheel Drive Association, $10,000 to Washington County Search and Rescue, $500 to the Blue Ribbon Coalition and $500 to Tread Lightly. With help from 170 volunteers and 87 trail leaders, and in conjunction with the 18 search and rescue volunteers, six volunteer recovery teams and all the great sponsors and vendors, Desert RATS said it was able to host the largest event to date. 736 vehicles enjoyed three days of beautiful scenic trails, while some took on the red slick rock and crawled their way through epic trails located at Sand Mountain Recreation Area and the surrounding areas. After a day’s worth of off-roading, thousands of people converged at the three-day vendor show at the Washington County Fairgrounds, where many of the participants won donated prizes at both the bingo night and raffle dinner. After the 2019 Winter 4×4 Jamboree, Desert RATS board members had a meeting to confirm the donation amounts to be given to each organization and said they were amazed by the contributions that everyone made to the event.